CofE rejects Bishops’ Report: The Church of England’s General Synod has rejected a report by the Church’s bishops which restated the Christian belief that marriage was between a man and a woman. The report failed to gain approval in all three Houses of the General Synod, losing in the House of Clergy with 93 voting in favor and 100 against. The report was approved by the House of Bishops and the House of Laity and is now barred from being discussed until the end of the current Synod in 2020. Bishop of Sheffield: The traditionalist Forward in Faith, Anglo-Catholic Suffragan Bishop of Burnley, The Rt. Rev. Philip North, has declined his call to become Bishop of Sheffield. North’s decision followed outspoken criticism of his appointment by supporters of the ordination of women. It was claimed that North, who believes in an all male priesthood, would not be able to minister to the women priests in the Diocese of Sheffield. Bishop North’s decision and the circumstances that led to it, have called the Church of England’s ability to respect the ministry of those who do not support the ordination of women into question. 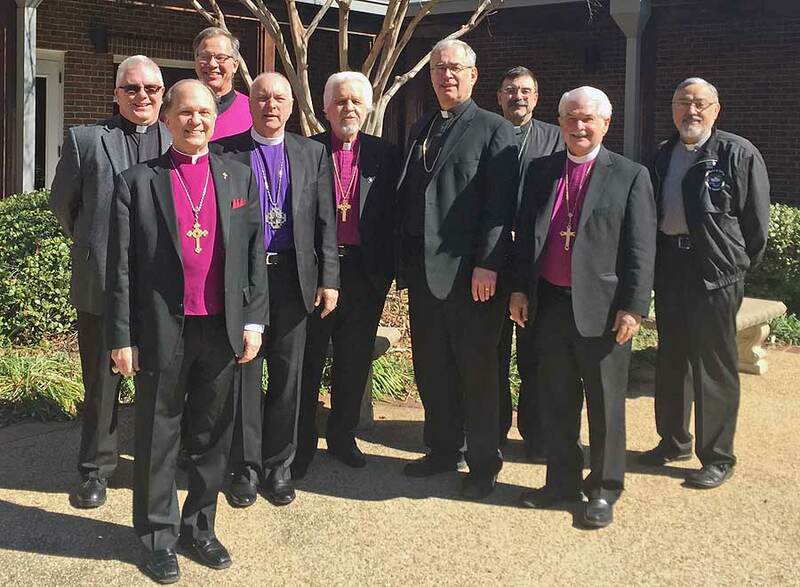 ACNA Meets With PNCC: Representatives of the Polish National Catholic Church (PNCC) and the Anglican Church in North America (ACNA) met for the Tenth Ecumenical Dialogue Meeting at St. Vincent’s Cathedral in Bedford, Texas, on February 15-16, 2017. Bishop Paul Sobiechowski, Bishop John Mack, Father Senior Robert Nemkovich, Father Senior Augustus Sicard, SMOP, and Father John Kowalczyk, were in attendance representing the PNCC. Bishop Ray Sutton, Bishop Richard Lipka, Bishop Keith Ackerman, Bishop Jack Iker and Father Thomas Vece, FSJ, were in attendance representing the ACNA. Papers were presented concerning Apostolic Succession, the Synods of the Church, and the Unity of the Church. The Eleventh Ecumenical Dialogue Meeting is scheduled for September 18-20, 2017 in Scranton, Pennsylvania. The sparkling ash can be bought for a “donation” of $10. Bishop Sutton Becomes Presiding Bishop: Forward in Faith North America Council member, Bishop Ray Sutton, has become Presiding Bishop of the Reformed Episcopal Church (REC). Sutton takes over from the REC’s previous Presiding Bishop, Royal Grote, who died last year. Bishop Sutton will remain Ordinary of the Diocese of Mid America as well as taking on his new duties as Presiding Bishop. Sutton has stated that he is “honored and humbled” by his new appointment. Forward in Christ congratulates Bishop Sutton and urges your prayers on his behalf and that of the REC as he takes on his new ministry. Continuing Church Unity: A joint synod is planned for October, 2017, at which four Anglican Continuing Church groups hope to work towards greater unity. According to their press release, the Churches are united by commitments to credal orthodoxy; to traditional Anglican worship; to the three-fold Apostolic ministry of male bishops, priests, and deacons; and to traditional morality in issues affecting the sanctity of life and human sexuality. The four jurisdictions claim some 300 churches in North America and more overseas. Please pray for the success of the October synod. Annual Assembly: Forward in Faith North America’s Annual Assembly will be held in Hurst, Texas, July 26-28, on the theme: “Celebrating God’s design for marriage, family and the single life.” Save the date!